This Cotes du Rhone was our choice to accompany our Valentines Day meal of bacon-wrapped filet mignon and lobster tail. 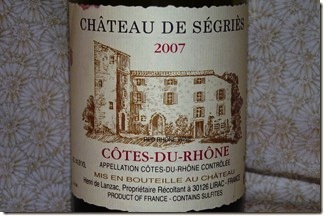 The Chateau de Segries is a Rhone blend that was a great value at $13 when we picked it up at Corks about a year ago. 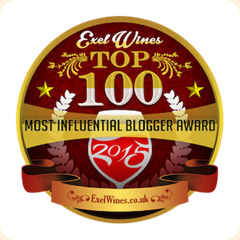 This blend is dominated by Grenache which smoothes out the natural earthiness of the Syrah. For interest there are small amounts of Cinsault and Carignan. The balance is great and was a neat fit with both the “surf” and the “turf.” Although not a natural match with our crème Brule dessert, we were enjoying it so much the wine kept flowing. The flavor is round with wafting cherry and had enough backdoor spiciness to keep things interesting. An enjoyable sipper.